Puspita Ayu Permatasari, PhD candidate in ICT for intangible heritage and tourism, USI – Università della Svizzera italiana, Lugano, Switzerland. Puspita is of Indonesian origin. 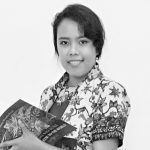 Her PhD research is focusing on the linkage and the communication model of UNESCO intangible heritage of Indonesian Batik textiles with global fashion and tourism.